With a name translated as ‘The Palace’, it’ll come as no surprise that Jumeirah Al Qasr is unbelievably luxurious and regal. 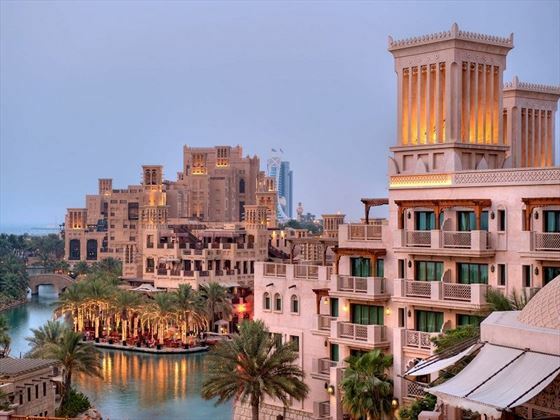 One of four hotels in the Madinat Jumeirah resort, this beautiful hotel is built in the style of an exquisite royal summer residence, with traditional royal architecture in a contemporary twist. 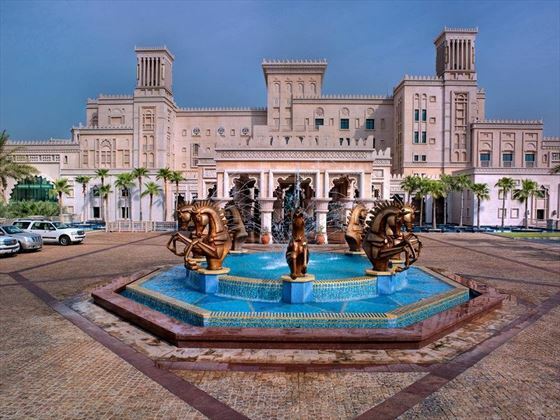 With sculpted Arabian horses and beautiful landscaped gardens, your breath will be taken away at every corner. The room and suite interiors are just as luxurious, with lots of rich colours, glitzy décor and luxury amenities – including private balconies with phenomenal views. 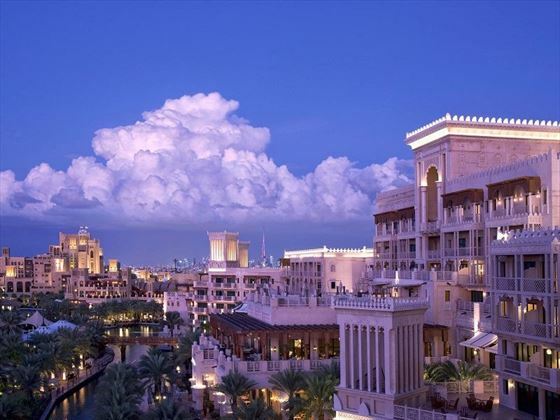 As part of Madinat Jumeirah, guests have access to a plethora of facilities. 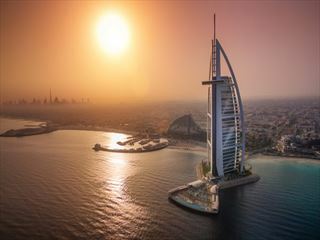 The Talise Spa offers the perfect tranquil ambience for an afternoon of unwinding, or the hotel is home to one of the largest pool areas in Dubai, right by the picturesque Burj Al Arab Jumeirah. Families will love the unlimited complimentary entry to Wild Wadi Waterpark™, and Sinbad’s Kids Club offers over 1,000sqm of fun play areas to enjoy. After a day full of fun and excitement, the resort has over 50 restaurants, bars and lounges to feed your appetite, including modern American eateries, deliciously authentic Asian cuisine, and flavoursome Middle Eastern dishes. 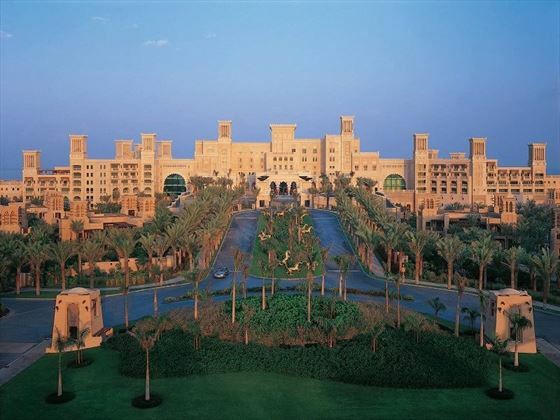 If that wasn’t enough, guests will also have access to the other three hotels’ facilities in the resort, Jumeirah Dar Al Masyaf, Jumeirah Mina A'Salam, and Jumeirah Al Naseem. 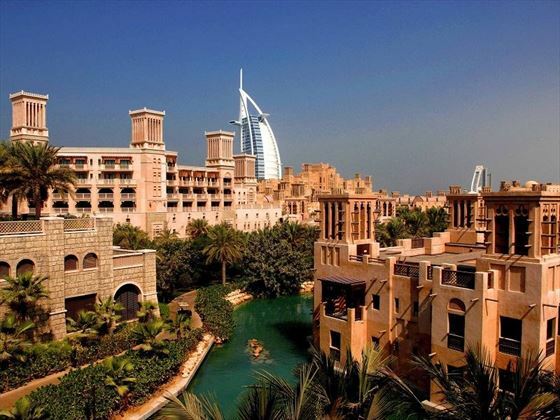 Part of the Madinat Jumeriah resort, Jumeirah Al Qasr is nestled in on two kilometres of sandy private beach and clear waters, adjacent to the Burj Al Arab and surrounded by manicured gardens, this hotel holds the perfect mix of seclusion, serenity and lots of exciting things to do. An abundance of luxurious shopping centres, restaurants and bars are just steps away from your hotel, with the popular Mall of the Emirates and Ski Dubai just 10 minutes away. As guests of this resort, you will receive complimentary passes to the Wild Wadi Waterpark, strongly recommended for a fun day out with aquatic rollercoasters, surfing machines, slides and tunnels. Downtown Dubai is just over 20 minutes away, filled with impressive malls, parks, famous landmarks, zoos and aquariums. Of course, with a pristine stretch of beach on your doorstep, a day or two full of relaxing on the warm sands with a cocktail in hand is a must. Transfer from Dubai airport by car is just over 20 minutes. 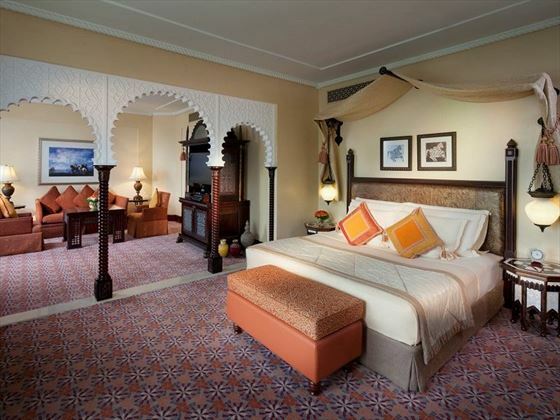 Arabian Deluxe – Picturesque 55sqm rooms, with regal décor and luscious garden resort views. Featuring a marble bathroom, a dressing area, and a private balcony. Sleeps three adults, or two adults and two children. Ocean Deluxe – Stylish 55sqm rooms, with antique furnishings and gorgeous views of the ocean. Featuring glass doors opening out onto your private balcony, plus a marble bathroom and dressing area. Sleeps three adults, or two adults and two children. Executive Ocean – Chic 55sqm rooms with lovely ocean views, featuring a private balcony and access to the Club Executive Lounge and Premium Leisure Club. Guests also receive complimentary airport transfers and breakfast. Sleeps three adults, or two adults and two children. 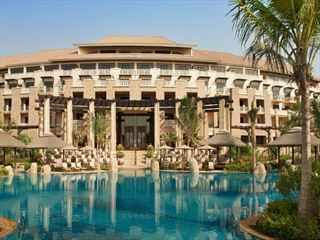 Executive Arabian – Vibrant 55sqm rooms boasting pretty garden resort views from the private balcony. Guests enjoy complimentary airport transfers, complimentary breakfast, and access to the Club Executive Lounge and Premium Leisure Club. Sleeps three adults, or two adults and two children. Junior Ocean Suite – Exquisite 80sqm suites with unsurpassed views of the ocean. Featuring a living area, a large balcony and terrace, and a marble bathroom. Sleeps three adults, or two adults and two children. 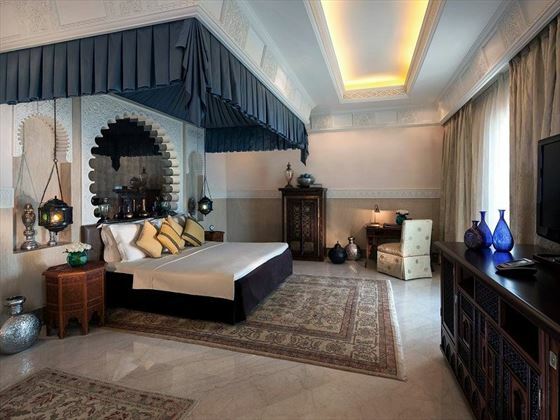 Junior Arabian Suite – With the same amenities as the Junior Ocean Suite, but with views of the gardens and scenic waterways. 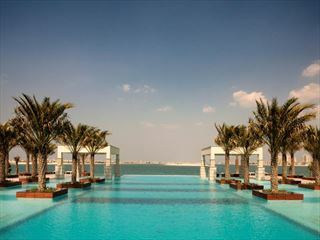 Superior Junior Ocean Suite – Tranquil 106sqm suites with panoramic views of the Arabian Gulf, wind towers and resort. Located on the top floor, these rooms also come with complimentary airport transfers, complimentary breakfast, and access to the Club Executive Lounge and Premium Leisure Club. Sleeps three adults, or two adults and two children. 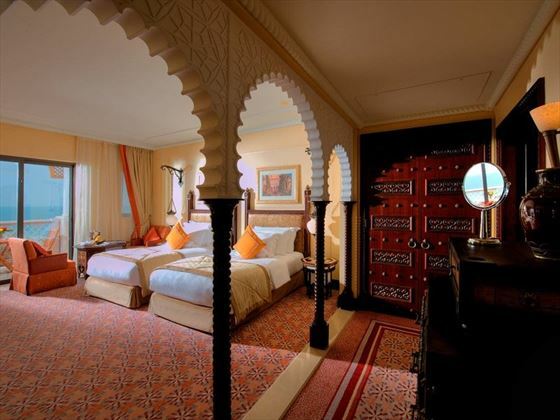 One Bedroom Arabian Suite – Trendy 105sqm suites boasting lush garden resort views. Featuring rich, traditional décor, a large living area, a dining area, private balcony and marble bathroom. You’ll also receive complimentary airport transfers and breakfast, plus Club Executive Lounge and Premium Leisure Club access. Sleeps three adults, or two adults and two children. One Bedroom Ocean Suite – With the same amenities as the One Bedroom Arabian Suite, this time with beautiful ocean views. 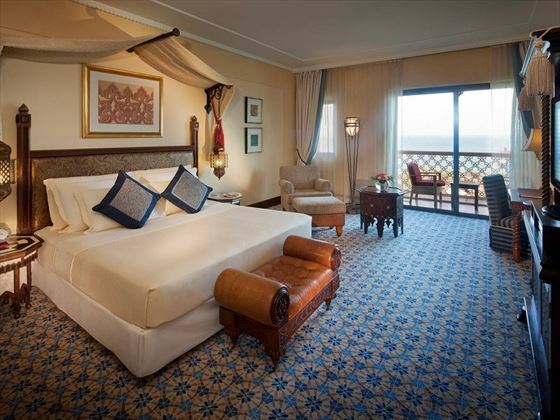 Presidential Suite – An opulent 180sqm suite, with panoramic views of the entire resort and glistening ocean. Boasting a private balcony, a large terrace, living area, two large bedrooms, Jacuzzis, complimentary airport transfers and breakfast, and access to the Club Executive Lounge and Premium Leisure Club. Sleeps four adults and two children, or five adults. 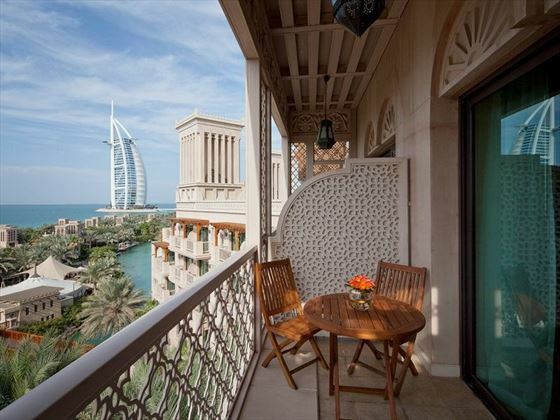 Royal One Bedroom Suite – Spacious 320sqm suites with opulent, Arabic décor and situated on the top floor. Features a butler service, a large terrace, and a private majilis (a traditional meeting place), as well as a Jacuzzi, dining area and kitchen. 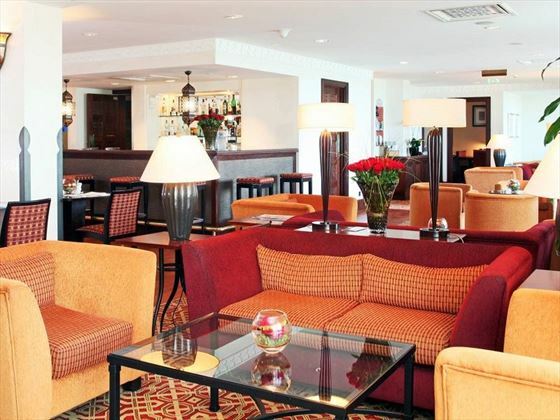 Guests also have access to the Club Executive Lounge and Premium Leisure Club, plus complimentary airport transfers and breakfast. Sleeps two adults and three children. Club Executive Lounge and Premium Leisure Club – Those staying in the appropriate suites will have access to wonderful amenities, including breakfast served in the buffet restaurants, complimentary return transfer to Dubai International Airport, exclusive use of the Lounge, with all-day tea, coffee and soft drinks, late check-out, and pre-dinner drinks and canapes from 6pm-8pm in the Lounge. Dotted around the resort are over 40 restaurants, all offering a vast variety of international cuisines. 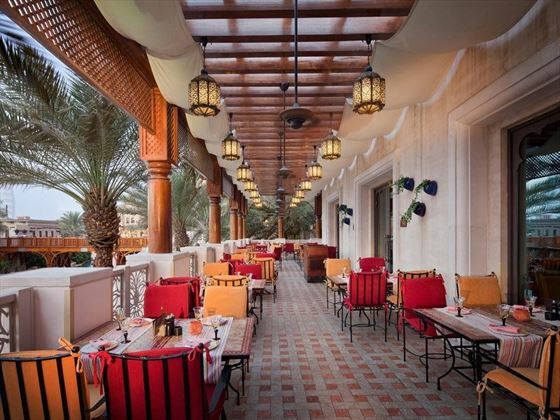 Whether you’re looking for a hearty family meal, or a romantic seafood dinner, Madinat Jumeirah offers it all. Zheng He’s – A cool, quintessential Asian restaurant. Tortuga – A warm and welcoming Mexican restaurant with traditional Mexico feasts. Hanaaya – Meaning happiness in Arabic, you’ll certainly be happy tucking in to this eclectic menu and watching the chefs cook right in front of you. Al Samar Lounge – The perfect spot for enjoying a traditional Middle Eastern afternoon tea – it’s a meal in itself here. Perry & Blackwelder’s Original Smokehouse – A casual eatery serving up sumptuous dishes inspired by Deep South BBQs. Segreto Restaurant & Bar – Hidden amidst the resort’s waterways and summer houses, this secluded Italian restaurant offers panoramic views from the bar’s rooftop terrace. Family days out don’t get much better than a complimentary trip to Wild Wadi Waterpark™.